Is Shakeology A Meal Replacement Shake? The TRUTH On Shakeology! A popular question asked is, “is Shakeology a meal replacement?” In this post we’re going to be answering that question and explaining what exactly Shakeology is and who should drink it. Like most things in life, the answer to the questions is, “it depends”. There usually isn’t black or white answer, the answer usually falls in a “grey area” somewhere. And the tricky part is that the grey area is different for everyone, which means the answer is different for everyone. To make things simple and to save you some time, here is the simple answer. Q. Is Shakeology a meal replacement? A. Yes, Shakeology can be used as a meal replacement. Shakeology can be used as a meal replacement shake for anyone that has a goal of losing weight. Shakeology is only 160 calories, so it’s a great way to get good nutrition in your body, without consuming a lot of calories. If you want to lose weight, you must have a daily calorie deficit, but you also don’t want to starve yourself or lack the proper nutrition your body needs. (You can learn more about calorie deficit and what you should shoot for here.) So if losing weight is your goal, you can replace a meal once a day with Shakeology. What Meal Should I Replace With Shakeology? Breakfast? Lunch? Or Dinner? The answer to this is, again, “it depends”. It really doesn’t matter which meal you replace, that is up to you and your personal preference. Usually replacing breakfast or lunch with Shakeology is the best option. 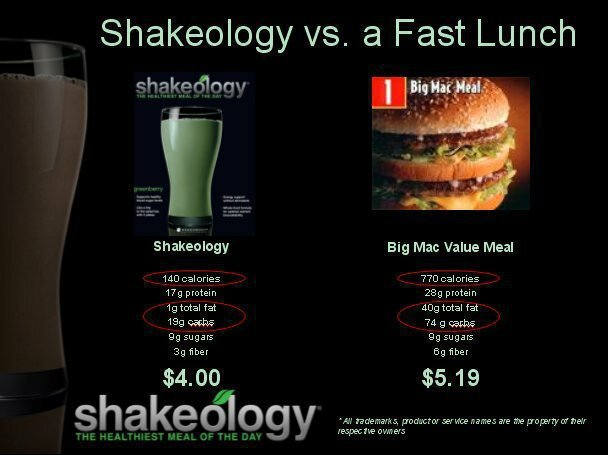 Choose whichever one is usually the unhealthiest meal for you, and replace it with Shakeology. Or make your decision based on convenience. For example, if you normally wake up late, rush out to work, and skip your breakfast, start having your Shakeology as your breakfast. It’s quick and easy to prepare and you can take it with you and drink it on the go. OK, Shakeology can replace a meal, I got it. But what if I’m not trying to lose weight? What if I’m trying to maintain my weight or trying to gain weight by building muscle? Is Shakeology a good option for me? Shakeology can replace a meal, but I don’t like to refer to it as a “meal replacement shake” because it doesn’t do it justice. Instead of calling Shakeology a meal replacement shake, I refer to it as a “Superfood Health Shake” because it is packed with superfood ingredients that are healthy for you. Therefore, Shakeology is not just for people that want to lose weight. Shakeology is for EVERYONE! I have been drinking Shakeology daily for close to 6 years. I’m not trying to lose weight so I don’t use Shakeology as a meal replacement. I use Shakeology as a mid-morning snack. It keeps me feeling full until lunchtime and curbs my cravings for sweets. Shakeology tastes great and I know it’s providing my body with great nutrition. Because Shakeology is only 160 calories, replacing an entire meal with it, for me personally, would not be a good idea. I need to consume more than 160 calories for my meals. How you use Shakeology will depend on your goals. It’s possible to use Shakeology as a meal replacement if you are trying to restrict calories. For most people, it will serve a delicious and healthy snack. It’s also important to note that you can easily increase the calories (and change the taste) of Shakeology by adding a few ingredients. For example, check out the Muddy Nutty Buddy Shakeology recipe below. Just a few ingredients bumped up the calorie count to 263. Lastly, in the video below, hear what Dr. Philip Ornstein, a retired podiatrist, has to say about his experience with Shakeology.